Nature and history combine to make a cycling holiday in Brittany a joy, says local author and historian Wendy Mewes, author of this excellent guide to cycling the Nantes-Brest Canal. Brittany occupies the north-west tip of France, the Amorican peninsula. The Roman name Armorica reflects the earlier Celtic Ar Mor – land of the sea – and being surrounded by sea on three sides gives the region its special flavour. Until 1532 it was a territory independent of France, and today remains unique in the country for its Celtic legacy. Most striking is the language of Breton, still spoken in the west, and a vibrant culture that is both traditional and open to innovation. Well-known images of Brittany are the colourful embroidered costumes and lace-headdresses of an earlier age, still proudly worn at the local festivals for which the region is famous. In general, the west is quieter and less-developed, giving a greater sense of being in a very distinctive area, quite unlike the rest of France. Religious traditions are very strong here – Brittany has more chapels and churches than any other French region – and the often strange legends of Breton saints vivify a strong oral culture. Brittany actually came into being as a result of incomers from Wales and south-west England merging with the indigenous population in the 4-6th centuries. Many of these arrivals were holy men and their followers, who came to convert the natives to Christianity. This is why Breton has close affinities with Cornish and Welsh, and why the western part still draws heavily on its Celtic roots. Eastern Brittany, by contrast, developed more from the influence of the Roman church and conquest by the Franks. The local language there, Gallo, derived from Latin. Brittany is also the megalithic capital of Europe, with standing stones (menhirs), including the tallest in France, Kerloas, near Brest, and neolithic burial places (dolmens) scattered liberally all over the landscape. Carnac with its thousands of stones ranging over several miles is not to be missed, but there are plenty of less well-known sites such as St-Just, near Redon. Brittany's main tourist attraction has long been its exceptional coastline, stretching for nearly 2,000km, if you include Loire-Atlantique, which historically was part of Brittany for a thousand years, and only severed by the Vichy government during WWII. The Pink Granite coast near Perros-Guirec in the north is perhaps the most famous section, but a mix of working ports, old-fashioned resort towns, fishing villages and vast lengths of unspoilt beaches, cliffs, creeks and estuaries offers a wide variety of experience for holiday-makers seeking sea and sand. Seafood (fruits de mer) and fresh fish is on the menu of almost every restaurant, or you can ‘pick your own’ as the rocky shore teams with marine life such as wild oysters, winkles and crabs. The interior – or Argoat (land of the woods) – is a constantly changing panorama of wooded hills and river valleys, high granite plateaux and rich farming land. The plain of Léon in the west in Finistere is the prime vegetable producing area of France, with artichokes, cauliflowers and onions (especially the prized oignon rose, sweet enough to eat like an apple) winging their way around the world. Brittany Ferries was started in 1978 as a means of transporting these valuables to the markets in Cornwall. Eastern Brittany is the main cattle-rearing region, and the land of the chestnut, with many festivals celebrating its culinary possibilities. The Monts d’Arrée in Finistere – not exactly mountains at 400m – are the highest hills, an eerie series of schist and quartzite crags rising from the misty moors and peat bogs. Brittany is a great place for a bike ride if you are not so keen on hills. The capital of Brittany is Rennes, in the department of Ille-et-Vilaine. The major centres in Finistere are Brest, on the Atlantic seaboard, and Quimper, the capital, with its fabulous cathedral and lovely shops in ancient buildings. Vannes, the main town of Morbihan, has a fine set of medieval walls and a port leading to the Gulf of Morbihan. In the north, St-Brieuc, a strangely claustrophobic place, is the capital of Côtes d’Armor, but Dinan and St-Malo are far more appealing destinations for rich history and modern entertainments. Top tourist attractions in Brittany include Oceanopolis (in French), one of the most-visited places in France, and the fantastic Château de Fougères, the ultimate in medieval castles with an ultra-modern presentation. Brittany has never been an area of great wealth or ostentation, but many small museums admirably reflect the history and traditional life-styles of a simple but proud society. Colourful costumes and the unforgettable Breton dancing can be enjoyed year-round at the fest-noz (literally ‘night-feast’). This event draws local communities together with a meal followed by music and dance well into the night. It’s the great outdoors that Brittany does best, with cycling, walking, and horse-riding to suit every level of ability and stamina. The sheer variety of scenery is impressive, and you will rarely be far from a megalithic site, a ruined castle, rural chapel or sacred spring. Bird reserves on the Sept Iles and at Cap Sizun draw twitchers from all over the world, and those taking a boat to the Atlantic islands of Molène and Ouessant may well enjoy dolphins dancing alongside. Water-sports of all kinds are available, not just around the coast, but at the many lakes, such as huge Lac de Guerlédan in the heart of the region. 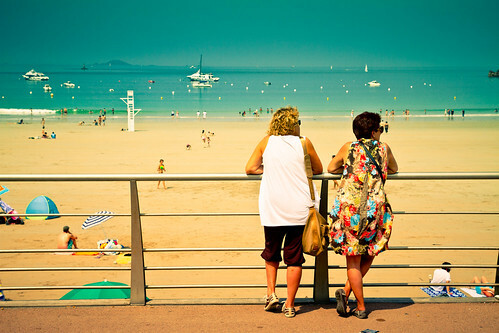 You can get a feel for what else is available at Brittany Walks or Randobreizh (French only). There's also comprehensive coverage at Brittany Tourism. Cycling in Brittany is a pleasure, with good toll-free roads and very light traffic in the countryside. Cycling is especially popular in Brittany, with five-times Tour de France winner Bernard Hinault a local inspiration for competitive riders. Cycling capital Plouay hosts a major Grand Prix each August. In almost every area you will find recommended cycle circuits, with tourist offices offering a pack of ‘velo’ or bike routes. There are also 12 VTT (vélo tout terrain = mountain bike) centres which provide specialised information, cycle maps, bike hire, cleaning facilities and advice. Details of these can be found on the Randobreizh site (in French), together with a list of places to hire bikes if you're not bringing your own, and bicycle repair shops. 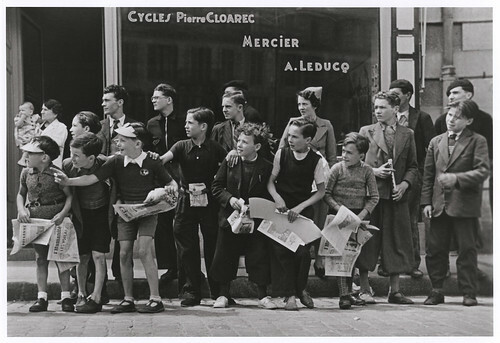 As most communes have a cycle club, you will not have to look far for help. 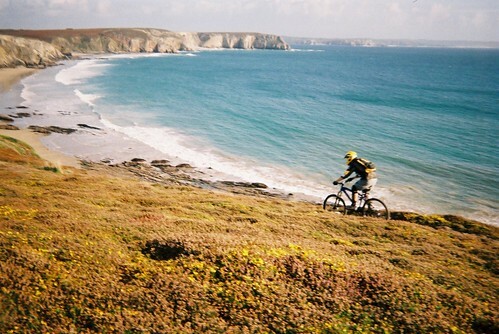 For bike rental in Brittany, see our bike hire listings. The Nantes-Brest canal runs right across Brittany and can be cycled in entirety. The development of the green ways (voies vertes) – old railway lines and canal towpaths – is an ongoing project, with hundreds of miles of tracks already enjoyed by cyclists. When the system is fully functioning, it will be possible to cycle right across Brittany and north/south at each end of the region. The current paths are fully detailed in G.H.Randall’s book Brittany's Green Ways: A Guide to Re-Used Railway Tracks and Canal Towpaths (UK, US, Fr), which also has details of bike-friendly accommodation (see also G.H. Randall's green ways overview for Freewheeling France). If you fancy cycling the full 365km length of the Nantes-Brest Canal, see the Red Dog guide to the canal, which details the whole towpath in maps and includes places to stay along the way. The green heart of Brittany offers a multitude of quiet lanes and rural tracks for cyclists, with the area around Lac de Guerlédan (in French) providing a good starting point for many bike routes on and off the green ways. The coastal path is not open to cyclists, for environmental reasons and the potential danger to walkers on often narrow and maybe vertiginous routes. There are, however, many advised cycling routes to get the best sea-views and access to particular points of interest. The cities of Rennes (Velo Star – in French) and Vannes (Vélocéa – in French) have public bike hire schemes. Quimper is improving its provision for cycling. 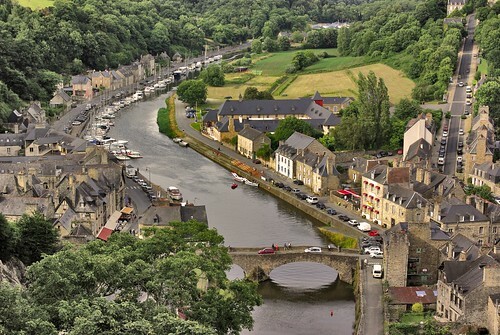 Search our organised tours section for some great self-guided tour options in Brittany. Nearly all cycle tours of Brittany take in the oyster capital Cancale and, just over the border in Normandy, Mont St-Michel. Search Brittany on our Where to stay page, or zoom in on the icons on our map below for links to places with secure parking and other facilities for cyclists. See also our tips on finding accommodation. For independent cyclists, La Grande Métairie is an excellent four-star campsite (with bike hire) near the marvellous megaliths of Carnac. The Footprint guide to Brittany has many more food and accommodation recommendations and reviews. Two budget airlines, Flybe and Ryanair, connect the UK to Brittany. You can fly cheaply to Dinard airport at Pleurtuit, but it does not have a shuttle service, so you’ll need to cycle (if you have your own bike) or take a taxi to get to St-Malo, 9km away. Flybe has budget flights into Rennes airport from Southampton, Manchester, Leeds, Edinburgh, Glasgow and Belfast. The airport is 20min by bus (No.57) from the centre. Both Ryanair and Flybe have flights to Brest (Guipavas) airport, with a bus shuttle service to the city centre and station. Car hire facilities are available at all the airports. Direct ferries to Brittany are run only by Brittany Ferries, with sailings to St-Malo from Portsmouth (9-10 hrs), or from Plymouth to Roscoff (6-8 hrs). This monopoly makes fares expensive, so an alternative route is to cross the eastern end of the Channel or to Cherbourg and make the cycle ride to Brittany part of your tour; if you're driving, it's about seven hours from Calais, or three from Caen or Cherbourg, but don’t forget the added cost of motorway tolls and petrol. By train, Eurostar goes from St-Pancras to Paris, Gare du Nord (2 hr 30 min), and then a high-speed TGV from Gare Montparnasse links the major towns in Brittany (Rennes 2hr; Brest and Quimper 4hr). Changing from the Eurostar at Lille and proceeding direct to Rennes is easier, avoiding the station change in Paris. See voyages-sncf.com train times and ticket prices. See also our information on taking bikes on French trains. Brittany's Green Ways: A Guide to Re-Used Railway Tracks and Canal Towpaths (UK, US, Fr) is an invaluable guide, as is The Nantes-Brest Canal (UK, US, Fr), a guide for cyclists and walkers. German publisher Esterbauer Verlag has a cycling atlas that covers the coast of Brittany from Mont-St-Michel to St Pol-de-Léon. There are also two north-south routes from St Brieuc. Text and route notes are in German but the maps and map legends are in English and can be easily followed. French publisher Rando Editions has a guidebook, Le tour de la Bretagne à vélo, in French. See also Wendy's Freewheeling France guides to cycling the Nantes-Brest Canal, as well as her history of the Nantes-Brest Canal. She's also written our guide to St-Malo for cyclists using the Portsmouth ferry link, as well as overviews of Brest and Rennes.